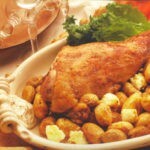 A very Greek way to enjoy Lamb, leg of Lamb with potatoes! I love salads and this Octopus salad is one of my all-time favorite salads! It is not difficult to make and when you do if you love Octopus you will fall in love and it will become a recipe you will make all the time! 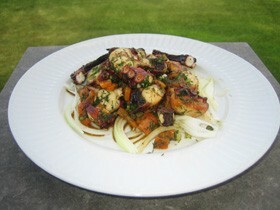 Serve this amazing Octopus salad when you serve fish, or when you serve mezedakia with Ouzo or some nice white wine! Wash octopus and grill over low fire turning occasionally, the grill has to be hot and oiled.You can also boil it in a little water, Octopus will release its own juices and it will be enough to boil until nice and tender.If you like add some spices while the octopus is boiling, a bay leaf, some black peppercorns,1 clove garlic, a little salt, and pepper. When done, cut Octopus into bite-size, pieces and place in a bowl. Add pepper, dill, green onion capers, oil and lemon juice, toss very well together. 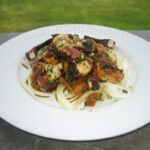 On a serving plate, place the rondels of onion as a base and on top place your octopus salad! Always adjust seasonings according to your taste. That means you have to taste your octopus! You can serve as a salad or meze. Where ever you are, make the summer last! Everyone from a European background when immigrating to North America is complaining about the lifestyle in their new country! In Europe the south that is, they say life is more fun more relaxed and people enjoy the outdoors more, and it makes sense because the weather has a lot to do with it, but don’t kid yourselves it’s an individual matter how everyone decides and plans to spend the same 24 hours we all have, no matter how the weather is. 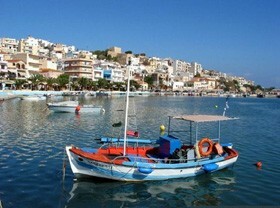 Mezedakia and Ouzaki is a wonderful experience in a taverna by the sea. But it can also be exciting when friends get together to indulge in the tradition that once was a privilege of men but now enjoyed by women as well!! So next time you have a few good friends over, why not plan mezedakia that pair well with Ouzo and pretend you are in Santorini or Mykonos! And who knows maybe next summer the dream can be a reality. Mezedakia can include a salad, a mélange of olives, cheese, octopus, shrimp, fried eggplant and zucchini and I love a Dako a specialty from the island of Crete, so easy and yet so different. Don’t forget to add to the spirit of the evening some Greek music, Dalaras, Glikeria, Alexiou, are some of my favorite artists and your event with a little effort can be something out of the ordinary!